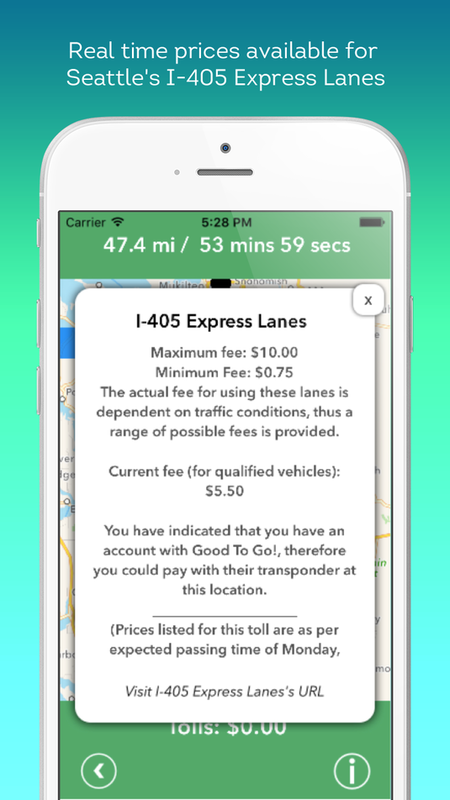 Full US Coverage of Express Lanes Now Available on Tollsmart! 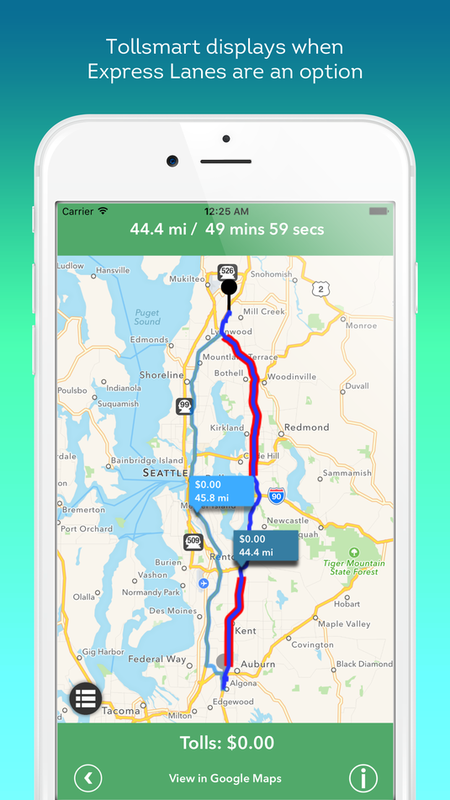 A few short months ago we announced that we added support for four Express Lanes in the Tollsmart apps (two in the DC area and two in Seattle) with the goal of rolling out all HOT/Express Lanes in the US. Today we're thrilled to announce we've achieved that goal and that Tollsmart now supports every Express Lane in the US. This means that Tollsmart will alert you to any Express Lanes along your route so you know you'll have an option for avoiding traffic when traveling through metro areas. No other mapping service provides this type of visibility into tolling information. Tollsmart is maps like you've never seen before. We know how important real-time information is to people and want to help drivers make informed choices about their route options. That's why we decided to make I405 express toll lane rates publicly available as a live, open-source data stream. We're happy to see apps using this data and hope that it will give drivers a more predictable trip so that they can take more control over their commute. We applaud WSDOT's transparency and efforts to educate drivers on how tolling on these new lanes work and encourage other state agencies to take similar steps to make this information broadly available to the traveling public. To activate the Express Lanes in Tollsmart go the Options menu and tap on the HOT/Express Lanes button. That will display a screen where you can switch on the feature by sliding the button to 'on' (it will turn green). You'll also be prompted to provide the number of occupants, which will determine if you've met the carpool requirements. The app will remember the settings, which you can go back to change at any time. Now when a route is entered where Express Lanes are an option Tollsmart will display double red lines along that section of the route, or grey lines where they exist but may not be available based on your selected vehicle type, transponder or at the predicted time of crossing. Tapping on the lanes displays additional information such as pricing, transponder information and, when available, a link to the official site of the toll authority that operates the lanes. Pricing for the +20 Express Lanes now in Tollsmart vary from congestion-based prices to those that change based on time of day. For the latter we include the actual prices based on when you are expected to cross the lanes, and for those based on real-time traffic patterns (with the exception of the 405 lanes) we provide a range of minimum or maximum prices based on distance travelled while we work to get more real time prices added. Important to note is that Tollsmart does NOT include the prices for Express Lanes in the toll calculation for a route. Also, note that some lanes require a special 'Flex' transponder for those travelers that meet the minimum vehicle occupancy requirements to ride on them for free. To learn more about Express Lanes on Tollsmart visit the new Express Lanes section of our site, or contact us as we'd love to hear from you!